Wailea Ekahi Village is ocean front in sunny south Maui. 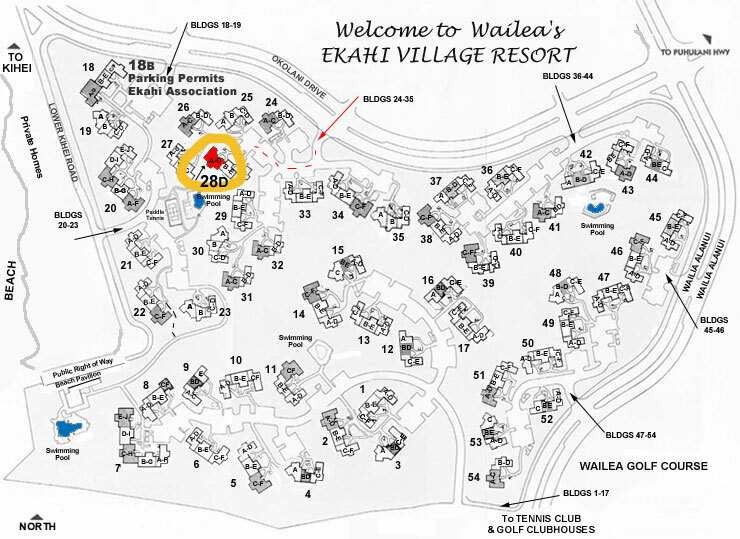 It was the first of the Wailea Condominium Villages built - hence it's name - Ekahi means "First" in Hawaiian. Situated on 34 acres sloping down to Keawakapu Beach, Ekahi is widely appreciated for its extensive & beautifully landscaped gardens, tropical color & exotic bird life. An amazing ocean front value, many people return to Ekahi year after year. The heated, ocean front pool area offers fantastic whale watching in season. If you come at the right time of year you can enjoy limes, papayas, bananas & avocados from trees throughout the complex. Our 2 herb gardens provide various spices for your favorite meal. You can walk the beach in either direction to reach restaurants for breakfast, lunch or dinner. Ekahi's fifty-four two story buildings use only ten of the total thirty-four acres, leaving plenty of landscaped, colorful tropical foliage and green spaces. 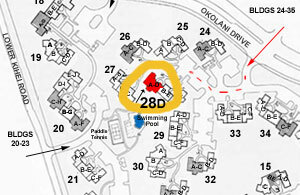 Parking for 28D is only steps from our entry door. Ekahi's ocean front pool & pavilion offer sun, shade & easy, gated access to the soft sands of Keawakapu Beach. Check our PHOTOS for a good feel of the resort. Wailea is Maui's premier resort area and master-planned community. Located on 1500 acres in the sunny "dry" part of Maui, Wailea is renowned for its spectacular beaches, unsurpassed golfing, gorgeous landscaping and luxurious accommodations. Wailea truly feels like a tropical paradise. It offers easy access to shopping, spas, ocean sports, biking and more, yet accommodations are quiet and pleasantly spacious. Here in South Maui, there are six golf courses and nine beaches within 10 minutes of our Wailea condo. You can walk to restaurants, tennis and shopping and spend lazy days in the pool or actively tour the island. South Maui is known as Maui's sunshine coast. With an average rain fall of just 10" per year, you can anticipate many sunny days. The temperature here is also ideal. Tropical trade winds keep us in the high 70's to low 80's (Farenheit) all year. Wailea is home to golf championships, tennis tournaments and parts of the Maui Film Festival. Wailea offers a large selection of excellent restaurants ranging from casual to fine dining. Maui's best shopping is available at the exclusive Shops at Wailea. Peaceful and quiet yet within minutes of activities, restaurants, shopping and entertainment... the "island feel" still offered in Wailea makes it our preferred location. Maui County consists of five islands, including Maui, Lanai and Molokai. 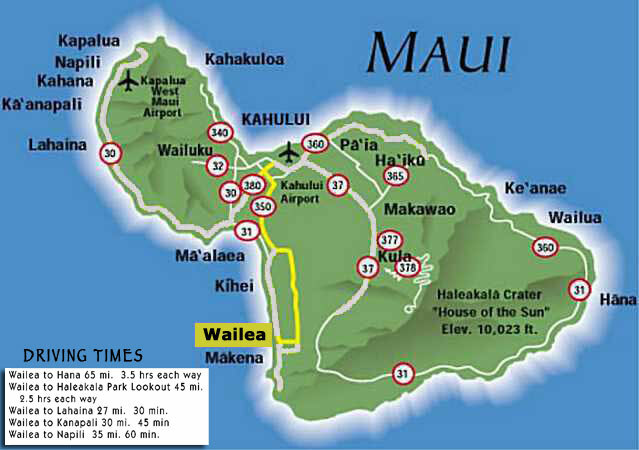 Maui is known as the "Valley Isle" because it was formed by two volcanoes, Puu Kukui (elev. 5,788 feet) in the northeast and Haleakala (elev. 10,023 feet) in the southwest, which are connected by a narrow isthmus of farming land, Maui is the most protected of all the Hawaiian Islands. The primary Maui airport located in Kahului offers direct flights from the mainland and Honolulu. It is on the north side of the island not far from famous windsurfing beaches near the unique town of Paia, and only 30 minutes from Wailea. "Maui is a magical, tropical playground like no other."